We are constantly striving to improve our services which mean that we are continually reviewing what we can offer our clients. As a result we are delighted to announce the introduction of reduced visit fee days. 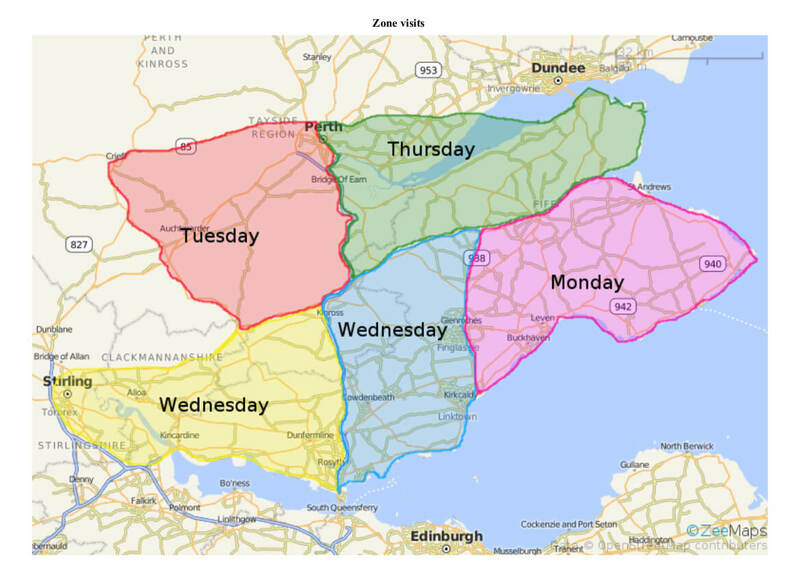 The new reduced visit fee is available on a select day, each week, which is set out in the map below. On the select day your visit fee will now cost just £21. In addition this reduced fee can be shared equally between the numbers of clients seen at the same time on the same yard, allowing for additional savings. Calls on reduced visit days will be booked on a first come, first serve basis and must be booked in advance through the office. Visit times will be allocated based on the most convenient time for the vet. Confirmation of your appointment time will be sent via text message after 4pm on the day prior to your appointment. Of course we will never refuse to give a client a visit if they need to be seen at short notice, or request a specific time, or vet. However if the vet’s day is fully booked another vet will attend at the clients convenience, which will be charged the standard visit fee. This will not affect your calls for veterinary work on any other day of the week and we will continue to offer you and your horse the same standard of service – this is simply a way of passing on some savings. Our emergency calls remain the same and do not qualify for reduced visit in or out of hours. T&C’s: Visit fee’s can be equally shared between the number of clients seen on the same yard. Reduced call outs do not apply to emergency visits. Reduced calls apply to set days only, as above. Vettings and extensive lameness investigations do not qualify for this offer.